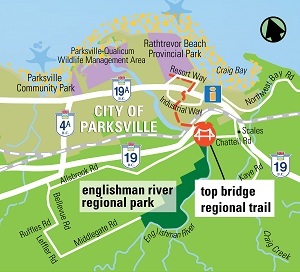 Inaugurated in 1999, the Top Bridge Trail connects Rathtrevor Beach Provincial Park on the Strait of Georgia with the Top Bridge Crossing, a magnificent pedestrian-cyclist suspension bridge spanning the Englishman River at a lively junction of parks and conservation area. The trail is five kilometres in length each way and offers a rustic ramble or bike ride away from the urban sea-side to the cool woodlands of the Englishman River. 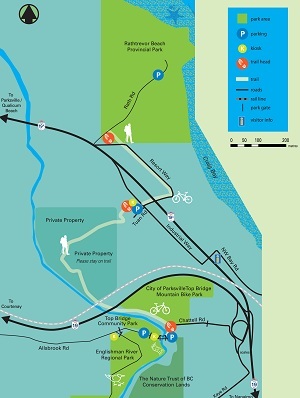 The mid-section of the trail passes through private property: users are requested to stay on the authorized trail route and respect private property. At Top Bridge, take a break, take a dip or just sit back on the rocks and enjoy the beauty of a famous salmon river.